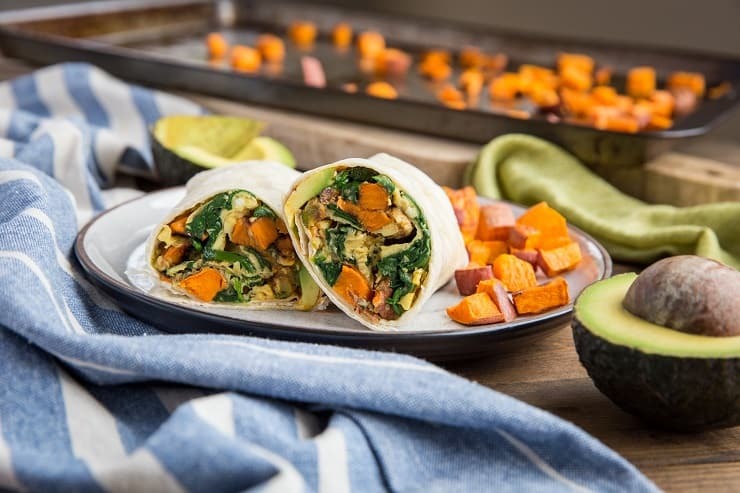 Vegetable-packed breakfast burritos with roasted sweet potato, zucchini, spinach, and avocado. These filling and delicious breakfast burritos are easy to customize and are the perfect way to start the day. To say breakfast is a big deal in my household would be an understatement. There is no skipping breakfast. Ever. You can imagine the sentence, “I forgot to eat breakfast” never escapes my lips. Back before my paleo days, I was all about eating cereal for breakfast…the kind you’d feed your toddler, not the kind any respectable adult should eat. Needless to say, I’ve been a savory breakfast eater since circa 2010. You’ve seen this shine through in my Butternut Squash Mushroom Bacon Frittata, Balsamic Roasted Vegetable Omelettes, Turkey, Beet, and Zucchini Hash, Tomato, Kale and Parmesan Baked Eggs, Zucchini, Arugula and Feta Frittata, Pear Apple Cheddar Caramelized Onion Bagel Sandwiches, and many, many more…but we have never discussed my obsession with breakfast burritos. There’s nothing like holding a warm, stuffed burrito in your two hands and having that hearty hunk of swaddled burrito bliss to bite into. Burrito foldage. How do you do yours? In my house, it’s a fold in the sides, then roll, then squeeze. You know, the ol’ fold, roll, squeeze. Typical. Let’s deconstruct the burrito ingredients, shall we? 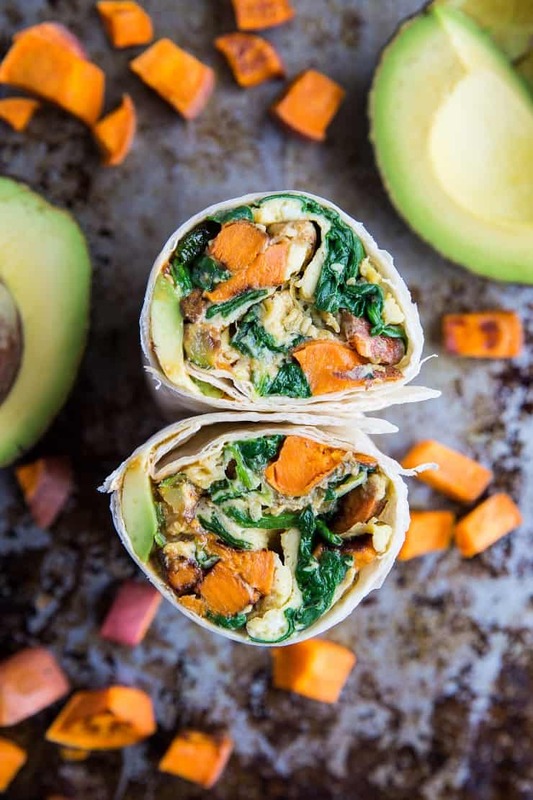 These burritos consist of roasted sweet potato, zucchini, and carrots with scrambled egg, spinach, and avocado. The combination here yields a super nutrient-dense breakfast that’s comforting, healthful, and filling. PLUS: delicious. 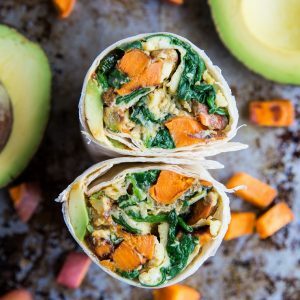 There are so many variations you can take with the roasted vegetable portion of this burrito…it’s customizable AF! 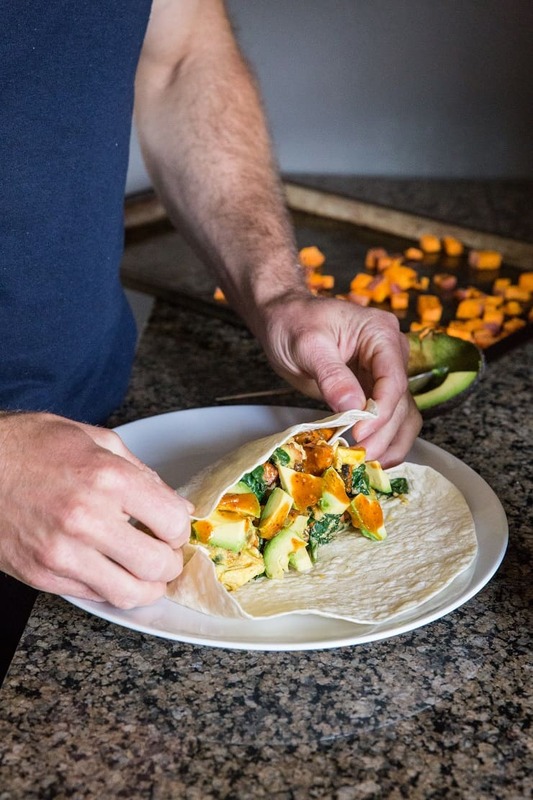 The recipe makes enough roasted vegetables for 4 to 6 large burritos, and you can customize the amount of eggs and spinach according to the amount of burritos you’re making. 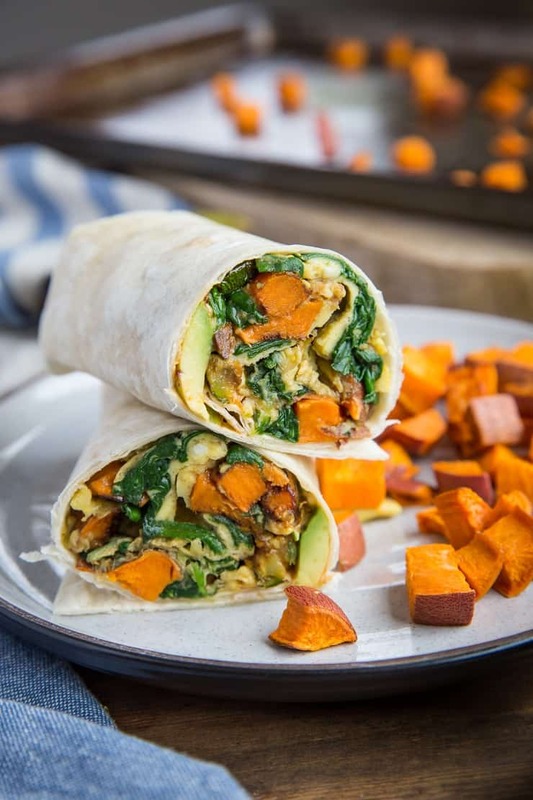 Prepare the roasted vegetables up to 5 days ahead of time and make burritos as desired by simply heating up some of the vegetables and making desired amount of scrambled eggs on the spot. Prepare 4 to 6 burritos ahead of time and store them in a sealed container in the refrigerator for up to 4 days. Add cheese if you do dairy – cheddar, gruyere and gouda taste great! Incorporate your favorite breakfast meat such as sausage, chorizo, or bacon. Use your favorite homemade or store-bought salsa. Swap the sweet potato for russet or red potato. If you eat gluten-free like me, use gluten-free flour tortillas or turn this into a breakfast taco using corn tortillas. You can turn this into a paleo breakfast taco situation by using paleo tortillas (Siete makes great paleo tortillas, which you can find at Whole Foods or other natural food stores). 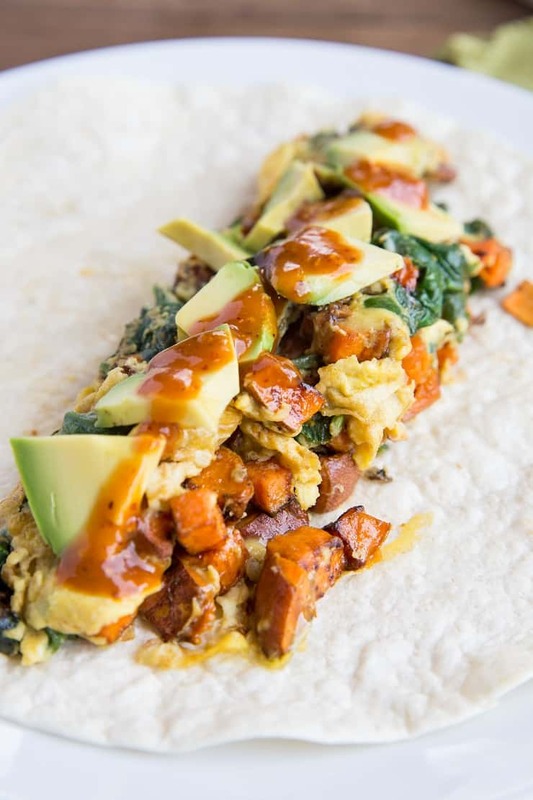 You can make a big batch of these breakfast burritos ahead of time and make them a grab-and-go breakfast for weekday mornings. Either way, you’re in for a swaddly cozy experience sure to make you swoon. Preheat the oven to 425 degrees F. Spread the vegetables on 2 large baking sheets. Drizzle with oil and sprinkle with sea salt. Use your hands to toss everything together until well coated. Roast 20 to 30 minutes, until vegetables are golden-brown and cooked through. Heat the ghee (or butter/olive oil) in a large non-stick skillet over medium heat. Add the spinach and cover. Cook, stirring occasionally, until spinach has wilted, about 2 minutes. Uncover and continue cooking 1 minute to allow excess moisture to burn off. Pour the beaten eggs into the skillet evenly over the spinach and allow them to cook 1 to 2 minutes, until they begin to firm up. Use a spatula to flip the eggs to the other side and cook another 1 to 2 minutes. Continue cooking and flipping until eggs are cooked through. Season to taste with sea salt. Heat up the tortillas using your desired method (microwave, or wrap in foil and heat in the oven. I like heating mine in the oven after the roasted vegetables come out). Lay one tortilla on a large plate and add desired amount of roasted vegetables, scrambled eggs, and avocado. Top with any additional toppings. 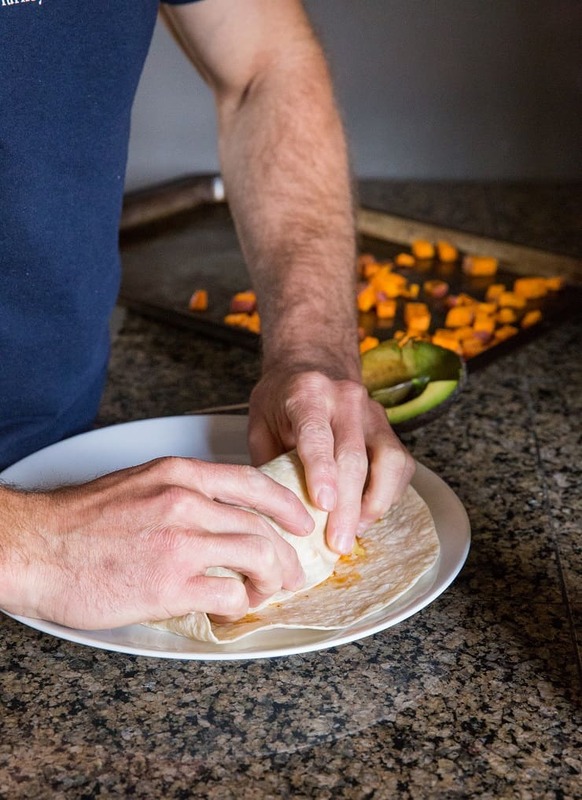 Fold in the sides of the tortilla then roll to form a burrito. Repeat for remaining breakfast burritos. I absolutely adore every ingredient in here. Can’t wait to make these very soon for weekend brunch! oh yum – these sound so good! Could these be frozen and then reheated to be able keep longer? Absolutely! I would freeze them without the avocado and once you reheat them you can add in the avocado 😀 Hope you enjoy!